OneParish is a single-stop solution: a beautiful new website, customized app, and parish management software, all under one roof. The OneParish App has encouraging features to help parishioners grow in faith and engage in parish life. The admin portal includes a full web-based administration system to help you manage your directory, organize donations, and send messages directly to parishioners via their smartphones. We are also proud to be the ONLY solution that works for parishioners without a smartphone. Welcome EVERYONE with OneParish! En Español - Spanish version available! "I love following the daily Mass readings on the train to work each morning." "Giving to my parish via my iPhone is amazing! Keep up the great work!" "This App will finally make me buy that smartphone!" Parishioners can access the OneParish opportunities for daily prayer like daily readings, saint of the day, and the role enrichment system. 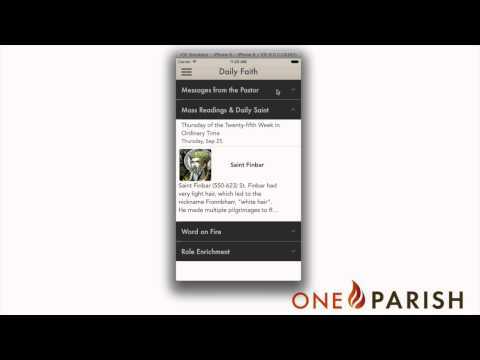 Involve your parishioners through the OneParish App. With functionality such as the calendar and pastor messages, parishioners can get the "inside scoop" from the parish. Engage your parishioners in service opportunities through the OneParish App. They can find activities which meet their unique set of gifts and talents and learn to serve the parish in more meaningful ways. Mobile giving through the OneParish App is easy, and intuitive, with the opportunity to set-up one-time or recurring donations. It makes tithing simple! More than a website, my.oneparish.com is your parish's customized home on the web. Everything in the OneParish app for mobile devices is available here as well: daily faith content, messaging, bulletins, donations and more. Welcome everyone with my.oneparish.com. In Daily Faith your parishioners will find encouraging content to guide you them your faith journey. Choose a daily role such as friend, mother, co-worker, and OneParish provides daily reminders and growth challenges. Read the Mass readings or keep up with the liturgical year via Saint of the Day. Find common and beloved Catholic prayers. Watch videos and listen to homilies from Fr. Robert Barron- the leading voice behind the culture-shifting Word on Fire organization. Find all these things and more under the DAILY FAITH tab on the App! Fast giving from your smartphone or PC. Set up crowdfunding campaigns to tell your story. Manage all your giving and reporting in one place. Share messages parish-wide or with specific groups and ministries. Send important announcements to smartphones and email simultaneous. Keep everyone looped in, effortlessly. Your parishioners can upload your own picture and information (as much or as little as they want) and change your info whenever you need to. Get alerted when new families join the parish. Listen to great Catholic content 24/7 streaming live from RELEVANT RADIO and RADIO MARIA. Make it easy to find Mass any day of the week (or even on Holy Days)- you can find it right here under 'MASS TIMES FINDER.' When you find yourself traveling over the holidays you can quickly look up nearby churches and find their mass and confession times. AFFORDABLE FOR ALL PARISHES - FREE FOR MANY! We love hearing your feedback! Please let us know any questions, concerns, or just how much you love using the OneParish App!